Yesterday was the one year anniversary of my first post to the blog. It’s amazing to look back and see how far I’ve come in this journey. A lot has happened this year and I never imagined that a recipe box would be such an integral part of that experience. I’ve learned a lot, not only in the kitchen, but about myself as well. And I’ve tried so many things I may not have taken a chance on had I not challenged myself with this project. 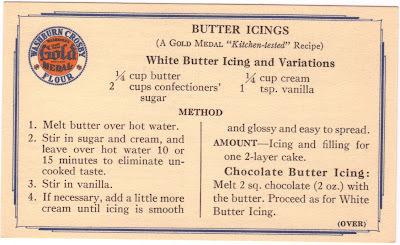 In one of the first few posts, I listed all the categories and how many recipes are contained on the cards in the box. 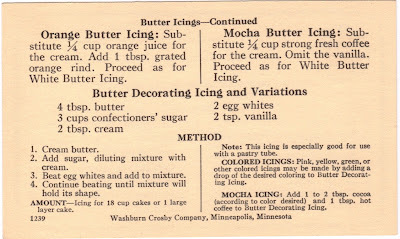 Of the 479 recipes, I’ve posted 102 (including today’s post). On one hand, I can’t believe how many new recipes I’ve made in the past year. On the other, I realize I have a long way to go! But as I stated in the beginning, this project wasn’t something that I wanted to complete in a certain time frame. Also, due to budget restraints and amount of people willing to eat the large number of cakes and desserts, I need to spread out the recipes and allow a few calories to be burned before I fill friends’ and family’s plates with more food. So I hope you’re all willing to hang in there for a while, because there is a lot left to accomplish in the kitchen! Each recipe has taught me something. I’ve learned new skills in the kitchen, such has how to separate eggs and can apple butter. Through the trials and tribulations of making frosting, I’ve learned that I loathe boiled icing, but appreciate the challenge of sticking with it until I’ve conquered the task. I’ve even gotten several history lessons and have been introduced to amazing people such as Lucretia Brown and Clementine Paddleford. And last April, I embarked on a journey of my own that I realize I never reported back on. April was International Fake Journal Month and for four weeks, I kept a journal that I wrote from the perspective of the woman who used to own this box. It’s all speculative, but after spending so much time with her recipes, I felt very connected to her and believe that by paying attention to what she collected, I could learn a little more about her. I believe she was an entertainer. So many of these recipes feed quite a few people and I think she had a large group of family and friends that she had over often for parties, celebrations or casual get-togethers. She was a thoughtful and generous person. She put a lot of care and love into each dish she made and I believe everyone who tasted her food could feel that love. 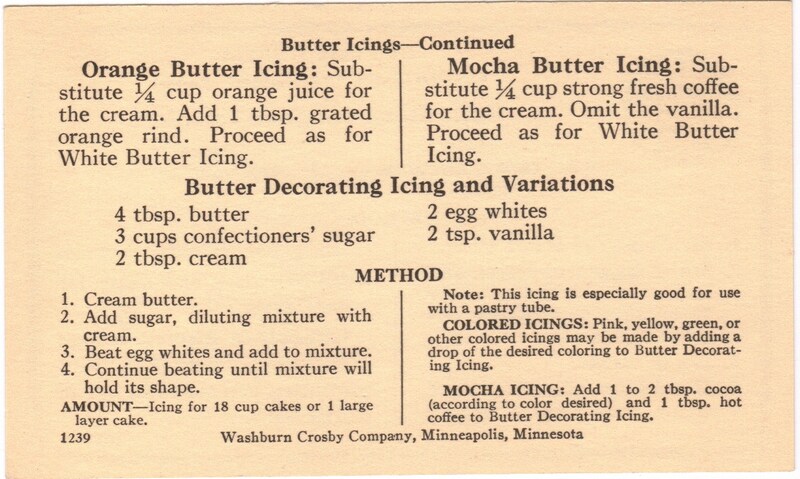 And she wasn’t afraid of a challenge, obviously since she had so many cakes that required boiled icing! As I wrote about this woman, a name came to mind and has stuck in my heart from the first time it entered my thoughts: Elinor. I will probably never know who she really was, but for me, she will always be Elinor and I will always be grateful that she collected all of these cards and that they somehow found their way into my hands. Elinor has been with me through this entire journey, but she’s not the only one; there are a lot of people I need to thank for standing by my side for the past year. Most importantly I need to extend a huge round of gratitude to, my husband, Ryan. Ryan has been so encouraging and understanding throughout everything I’ve attempted and taken on over the past twelve months. He’s endured a kitchen that is constantly in a state of chaos, an ever-growing collection of utensils that we simply have no room for and are scattered throughout the house, a constant barrage of desserts (a challenge for him because he really doesn’t have a sweet tooth), and he’s even been understanding when I do crazy things like make dresses for dolls that are going to be placed on a cake or go hunting for plastic animals to create a merry-go-round cake topper. Through all of that, he has enthusiastically been a food-tester, no matter what the dish, and has offered a plentitude of hugs, both in congratulations on a job well done and in sympathy for a frustrating day in the kitchen. Thank you, Ryan, for everything. You are the most amazing husband a girl could ask for and I’m so proud to have you by my side through all the adventures we take in life. And to my dog, Murphy, who has also been there through everything, usually sitting at my feet waiting for samples or a bowl to lick clean. I don’t know what I’d do without my dog, he truly is my best friend. He has provided so much fodder for things to write about in my blog posts and is always excited to try whatever I am concocting. Initially he wasn’t thrilled about the amount of time I spent in the kitchen, but has learned to be patient when he sees the mixing bowls and bag of flour emerge from the cabinets. Thank you, Murphy, you’re my sweet, sweet boy and cooking just wouldn’t be the same without you in the kitchen. Murphy brought his birthday monkey out for the celebration! To my parents who have also been encouraging and supportive through this entire journey. Thank you for letting me take over your kitchen every time I come home so that I can share this project with you. My whole life you guys have encouraged me to follow my dreams and go where my heart leads me. I bet you never imagined it would take me to the kitchen. But no matter where I’ve gone or what I’ve done, you’ve always been there to cheer me on, pick me up when I fall down and help me find my way back to where I was going. You have been amazing role models and my best friends. I love you guys, with all my heart. Thank you, for everything. I also need to thank my poetry group. Over the past year I have inundated them with countless amounts of calories and fat, usually in the form of chocolate or cake (or both) and they have graciously accepted every treat with enthusiasm and support. You guys are the best. Thank you for your encouragement and for helping me to consume all of this food. We have a long way to go, I hope you’re up for it! And most importantly, to all of you who read this blog. Thank you! Over the past year I have received some of the kindest and most supportive feedback from people I will probably never get the chance to meet face to face. When I started this project, I had no idea if anyone would be interested in what I was doing and have been amazed by the strong ties food can create. One of the best parts of the project has been meeting new people and hearing their stories behind some of the recipes in the box. Everyone has a family favorite and every family has their own special way of making it. Over the past year, I’ve learned the importance of keeping those stories close to our hearts and making sure those traditions are passed down from generation to generation. Food is, quite literally, a form of oral tradition only, you don’t just get to hear the story with your ears, you get to taste it and make it a part of who you are as well. 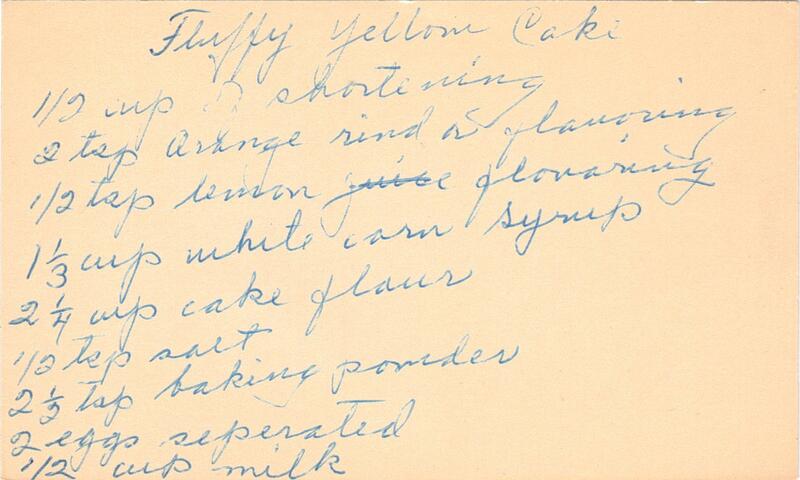 When I found this recipe box, it made me sad to think of someone’s family stories being sold off at an antique show. My main purpose when purchasing the box was to bring it home and show it the love it deserved. I had no idea how dramatically it would change my life. I hope that some of these recipes have found their way into your homes and that some will even become a family favorite that you’ll pass down through the generations. And I hope that wherever she is, Elinor knows that her cherished recipes are being loved and shared. 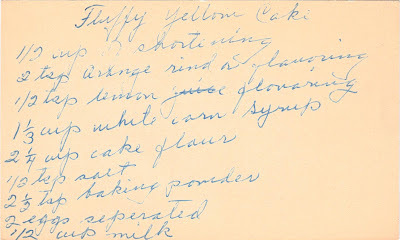 Especially her recipes for Fluffy Yellow Cake and Chocolate Butter Icing, which I chose to make for The Found Recipe Box’s birthday celebration. This is quite possibly my favorite cake recipe so far (I know, I keep saying that, but these are really good!). I was skeptical when I saw the list of ingredients for the cake, but these are so moist and the hint of flavor makes them a truly special treat. I used almond flavoring instead of orange and was very happy with the outcome. Add the chocolate butter icing to the top and you have the perfect way to celebrate a the birthday of a magical little box. There are just under 400 recipes left to make. I’m up for the challenge, are you? My goal this year is to dip a little deeper into the different categories, there are some I have yet to post recipes from (for example: appetizers, puddings and vegetables). 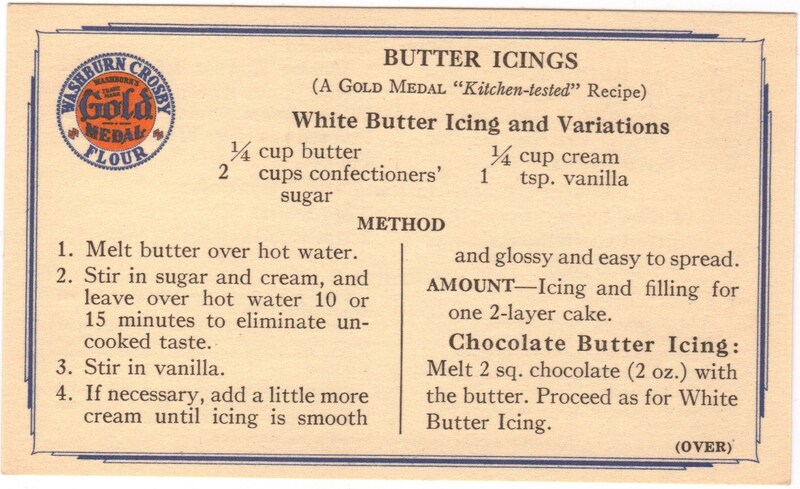 I also have a booklet that contains 48 Butter Crust Pie recipes. Originally I was going to make one and post the rest of the booklet, but I want to try to make them all. I’ve thought of inviting guest bakers who would be willing to donate their time and resources to help me achieve this goal. I also thought of donating the pies or having a bake sale. I’m still working on ideas, but if you have any of your own and would like to help out, let me know. You can send me an e-mail at thefoundrecipebox@hotmail.com or leave me a message on The Found Recipe Box Facebook page. I have some other exciting things planned for the next year and hope to incorporate a few field trips along the way as well. I’m excited to see where the rest of this journey takes me and to have you join me along the way. Thank you, all of you, for everything. Happy Birthday to The Found Recipe Box! yay molly!!! you know i'm always MORE than willing to serve as a taster (maybe i got ryan's sweet tooth as well as my own by accident?). congrats on your first anniversary with the box! Happy Blogiversary Molly!!! Oh, and those cupcakes...yum! By delving into the "other categories" I suppose you mean you are...leaving dessert? The horror!!! Happy blogiversary, Molly! I've enjoyed reading your posts and being inspired by your creativity! I can't wait to join you this coming year!